A place for exchanging comments, reviews, opinions, research, news, links, responses, ideas etc, about contemporary art on the Central Coast, and its social, ecological, political, educational and economic circumstances. We hope this blog will provide an arena for constructive analysis and commentary about the circumstances of practice for artists living and working on the Central Coast of NSW, a zone with disproportionately few resources for engaging with the critical edge of contemporary art. This project was recently on display for comment at Glebe Town Hall. Jenny received a grant from Gosford City Council in 2004 to make two public sculptural works at the Ourimbah campus, and showed work in the Art First Party exhibition at Mt Penang the same year. 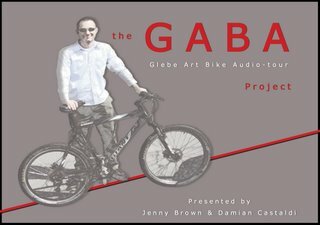 “The GABA is a mobile self-directed audiotour that incorporates ten custom built bicycles housed with GPS locative technology to navigate the bike rider towards any one of the tour’s historical, cultural and political intrigue hotspots along Glebe Point Road. The Glebe Art Bike Audiotour (GABA) is a fun informative eco-friendly way to discover Glebe’s rich and often hidden underbelly. As the rider reaches a designation the bike’s core tracking system will trigger the story for that place.” Jenny Brown and Damian Castaldi. The development of contemporary art and the infrastructure that has grown up around it has been built on artist directed initiatives and innovation. This has been the case in the past, and has been particularly important in Australia in the last 25years; and it will continue to be the case in the future. Governmental instrumentalities can play a major part in facilitating this development, and many have done so. The work of Richard Florida has proposed a demonstratable link between a rich urban cultural life and economic benefit, and this has motivated some regional governments to adopt more creative concepts of development beyond the conventional business model. The recently released Central Coast Regional Strategy invites comment. While many issues are addressed, water supply of course being a headliner, the plan identifies Gosford as being the Regional City for the Central Coast and the amenities that a regional city requires. The opportunity to comment on the strategy is an opportunity to argue for the central place of arts and culture in the developing Gosford Regional City. While planning is possible without aesthetic vision, good planning is not. Culture has always been the heart of a community and the city; it is what gives the social conglomerate an honourable and compassionate identity. What defines a city is its cultural assets. Sydney is an idea, and a destination, because it has a concentration of iconic cultural assets. MCA, AGNSW, Artspace, Sydney Opera House, Australian Centre for Photography, Australian Museum, Museum of Sydney, State and Mitchell Libraries, many Artist Run Initiatives etc. all within walking distance, and at a public transport hub. This is not to say that Gosford should, or could, model itself on a major city of four million people. But it does indicate the essential role that cultural resources play in creating a city. Shopping centres, supermarkets, sports clubs, businesses, car yards, professional services etc. can be found – and often the same ones are – in every urban and suburban centre. We go to Sydney for its cultural assets. Can we develop more of our own? The conventional market model does not seem to be working. Gosford CBD has become a rabbit warren of empty retail and business spaces. The Laycock Theatre and the Regional Gallery cannot be moved, but there are many other art and culture amenities, as yet underdeveloped, that could be given a place in the heart of the city. Many people feel estranged from the political decision making apparatus, but visit the website and make a comment. It just might help, and it might make a difference before it is too late. 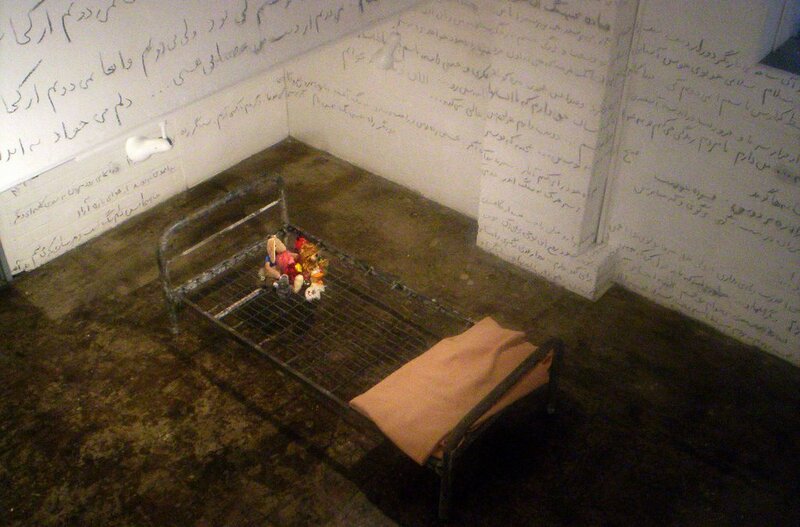 "This exhibition deals with the notion of diaspora. But, unlike the previous installation in which I made the viewer experience a sense of 'displacement/emplacement' (displacing them from where/what they used to go to/see and emplacing them into a new structure or pattern), this time I am exploring diaspora more on a personal level. By this I don't necessarily mean 'my' personal experience, but 'a' personal diasporic experience. However, in the artist's statement, (again, unlike the previous one), I have not directly pointed to the underlying concept of diaspora. I have rather written a few simple lines. I am giving the audience the freedom to interpret and comprehend the words and the work as they like." "Art is a state of encounter", Back Page is designed for artists in the region as well as for others who are interested in sharing their experiences of life in the cultural twilight zones, peripheries, grey areas, margins etc., here and elsewhere; however that might be understood. This is a moderated blog for dialogue about current and future circumstances of practice locally, and for critical reflection about this practice in the wider intellectual climate of international contemporary art.